Your home is your castle and it’s also a reflection of your personality and style. Keeping it beautiful takes a big investment, energy and passion. Properties in today’s communities are often maintained by trusted landscape professionals, and with trees, shrubs, lawn and plants, it’s a bit overwhelming to consider taking on this task. But you stay on top of it because your home is your family’s pride and joy. Home is where the heart is, and it shows! Your landscaping requires a weekly or bi-weekly upkeep, and the house is kept up in stages, the items most forgotten in the big picture is the concrete hardscapes. Often concrete is simply hidden in “plain sight” because it’s considered “back-gound noise”. A lot of owners don’t realize that concrete can be used to accentuate a property’s architectural design composition, and increase their assets’ value at the same time. Giving the concrete a make over will cause it to become an integral design features. We often overlook the boring, drab, gray patios and walkways. We’ve become so used to the ugly blotches and patterns of pool decks, and we haven’t even noticed that the sealers wore off and the color has faded off the stamped concrete. Probably because in our subconscious mind somewhere, we tell ourselves that “concrete is like a natural stone, and it is what it is“…. FORTUNATELY it is not the end of the road for that long forgotten concrete pool deck, patio and walkway. No longer is it the “step-child of architecture”. In fact, concrete has evolved to become the focal anchor point to many of today’s great buildings and homes. Properties are being remodeled and concrete is the feature that “Brings the finishing touch” to most projects. Remodeled concrete will rejuvenate the magnificence of any property. Landscaping will be framed in style and your entire property will stand out. 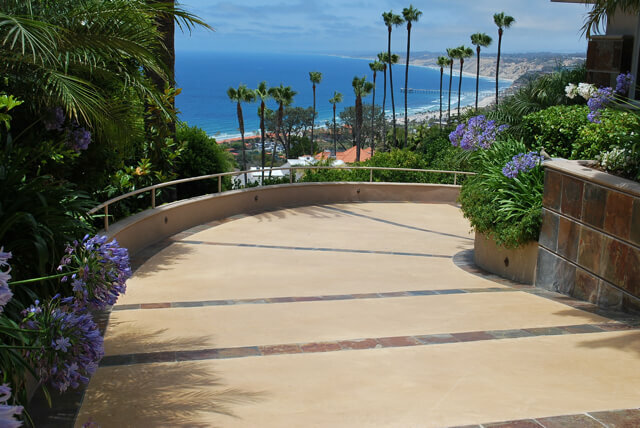 Concrete Remodelers’ coloration and sealer chemistry allows us to create endless aesthetic colors and patterns to achieve the finest results and best looking compositions for your property. We can change ugly, outdated terracotta colors to French Grays, or perhaps Jerusalem Stone. Forget about the blotchy patterns and standard gray, we will transform it into a marbled or subtle pastel, even a grand minimalist monotone. We’ve even made concrete look like blue-green pond water to extend the feel of a small tropical pool in La Jolla. We have even shifted the colors of pavers from “pinkish blah” to sandy-buff. Heck, if we can turn an ugly black epoxy retail floor into the most beautiful Spanish Stained floor, we are sure to help you design that beautiful aesthetic concrete look. Our portfolio is filled with many examples of properties we’ve helped our amazing customers transform into their fanciest desires.